Broco® Breaching Torch Kit » Protective Solutions, Inc. The Military and Tactical Breaching Torch PC/TACMOD1 carried torch system. The PC/TACMOD1 provides the capability of cutting linear feet of 1" thick steel in less than 10 minutes. It was created to meet the specialized requirements of the military's tactical cutting operations and is the basis for the U.S. Marine Corps' Assault Breachers' Torch Kit and also is in use with Army Special Forces, the FBI, and other federal and local special response teams. Kit setup is fast and easy. The use of hand-tight fittings and quick connects means no tools are required for assembly or disassembly. The PC/TACMOD1 torch kit uses Broco® cutting rods and RapidFire® cutting rod igniters (optional). RapidFire's fuel element reacts with oxygen to produce a preheat source facilitating near-instantaneous non-electric ignition of the cutting rods. For economical operations, the included battery ignition components allow easy lighting of the cutting rods. 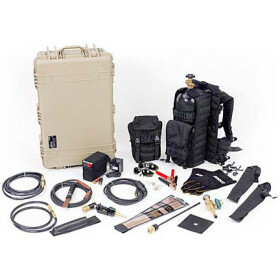 The PC/TACMOD1 comes complete with torch, high pressure oxygen cylinder (aluminum), regulator, hoses, Breachers A.R.C. Molle backpack assembly, battery ignition accessories, rod extender, rod quivers, leather shield, gloves, safety goggles and custom foamed storage case.